Microphone pick up patterns for live performance - advantages/disadvantages of cardioid, supercardioid or hypercardioid? I perform in small venues (sing and play acoustic/electric guitar) through a small PA system with a monitor on stage. I have several Shure SM58 Microphones that have a cardioid pickup pattern. I am considering buying a new mic or two and was wondering if there are advantages for live stage use, to a super-cardioid or hypercardiod pattern in a vocal mic as opposed to the standard cardioid pattern as on the SM-58. It seems to me that off axis rejection would be desirable, so I was considering a tighter pickup pattern. What are advantages and disadvantages of the different pickup patterns commonly used for live performance to amplify the vocals of one singer? Polar pattern: A microphone's directionality or polar pattern indicates how sensitive it is to sounds arriving at different angles about its central axis. Simply put, from which directions the microphone is capturing sound. The most common unidirectional microphone is a cardioid microphone, so named because the sensitivity pattern is a cardioid. The cardioid family of microphones are commonly used as vocal or speech microphones, since they are good at rejecting sounds from other directions. In three dimensions, the cardioid is shaped like an apple centred around the microphone which is the "stalk" of the apple. The cardioid response reduces pickup from the side and rear, helping to avoid feedback from the monitors. Since pressure gradient transducer microphones are directional, putting them very close to the sound source (at distances of a few centimeters) results in a bass boost. This is known as the proximity effect. The SM58 has been the most commonly used microphone for live vocals for more than 40 years demonstrating the importance and popularity of cardioid mics. With this in mind, the subject becomes more intuitive. The advantages and disadvantages are explicitly indicated by the polar pattern, by the graphs. 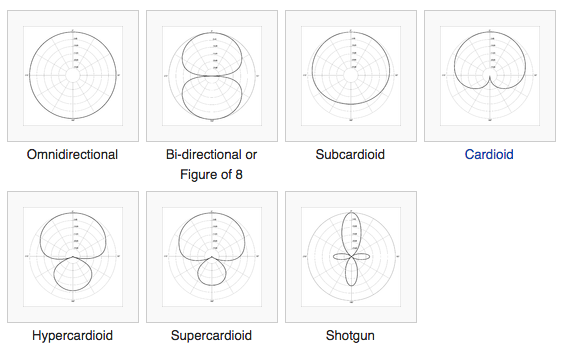 We see that the super and hypercardioids have more side rejection, but at the cost of some pickup at the rear. This is a very important thing to note, and a common misconception is that the only difference is the narrower area at the front. This means that the super and hypercardioids in general will be more feedback resistant as long as you have the area behind the mics sonically under control, otherwise you can end up with more feedback potential than with a cardioid. That's why it is so important to don't forget that super and hypercardioids have some sensitivity on the back. This means that you need to be very careful with monitor placement: they can't be too close to the mics, or pointing to the back of the mics. You also need to be careful with the acoustics and frequency balance. Reflected sound can reach the rear of the mic, and low frequencies coming from the front can refract to the back. In other words, if you are very careful and you know what you are doing, super and hypercardioids can be more feedback resistant and have better ambience rejection. Cardioid advantage: more rear rejection. Cardioid disadvantage: less side rejection. Hyper/supercardioid advantage: more side rejection. Hyper/supercardioid disadvantage: less rear rejection. Be flexible, have both a cardioid and super/hypercardioid in your mic repertoire, just in case you might have feedback problems on a specific stage, you can test which one is more feedback resistant (during the soundcheck, not the performance! ), and use the one that favors that specific venue and setup. Just remember that monitor placement and the acoustics of the venue are as important as the microphone choice. The 57/58 is a standard stage mic with good reason - durable, dependable, relatively inexpensive, and cardioid enough for the average volume singer. My primary reason for going with tighter patterns is if the singer sings softly and is fronting a band. Typically what happens with the standard cardioid in this case is that the singer can't hear herself and the monitors can't go any louder without feeding back through the vocal mic. Turning the band down isn't always an option, so in order to get higher monitor levels, we need more off axis rejection (or in-ear monitors, but that's a whole different kettle of fish). The primary advantage of super/hyper cardioids is more rejection of off axis sound. The only real disadvantage to microphones with tighter patterns is they are typically more expensive, and are less useful when needing a wider soundstage (e.g. two singers sharing a mic). Advantages of cardioid? Typically less expensive, and in the case of the dynamic 58, tank like durability. I've yet to meet a super/hyper as forgiving to abuse as the 58. A hypercardioid is more directional, so although it may allow you to have your monitors a bit MORE too loud :-) you need better mic technique. And the rear lobe means a floor wedge monitor shouldn't be placed directly behind the mic, but over a bit. Not the answer you're looking for? Browse other questions tagged performing live-sound microphones equipment or ask your own question. How to mic and amplify an accordion for live performance? How to setup Ivory ii for a live performance? live performance - Does my small acoustic band need amplification?